The Alto3 vineyards, located in Catamarca, 515 miles north of Mendoza, are some of the highest altitude vineyards in the world. At 4947 feet, they produce stellar grapes and critically acclaimed wines. The vineyards are situated adjacent to the Andes Mountain range on dry rocky soils that receive very scarce rain throughout the year (below 40 mm/1.6 inches). The desert-like soils and dramatic temperature contrasts between day and night contribute to very low yields of high quality grapes. 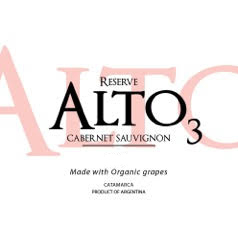 Alto3 uses only grapes from its 190-acre estate and yields are kept low. The grapes are carefully selected and handpicked into small cases of 30 pounds, and only native yeasts are used. After a 21-day maceration, the wines are aged for six months in American and French oak casks. No fining or filtering takes place. Ageing: 6 months in American and French oak casks, bottled unfined and unfiltered. Description: Inky purple with an enticing nose of spicy raspberry jam. Flavors of mocha and blackberry compote with notes of licorice and tobacco. Description: Inky purple with an attractive bouquet of toasty black currants. The wine has excellent depth with spicy black fruit flavors, light tannins, and a long finish.